Due to the widely varying nature of products and their packaging it is not surprising that display solutions are industry, product or sometimes brand specific in their design and construction. Whether for merchandising, dispensing, or purely to ‘glorify’ a product, they can seduce, persuade and stimulate a customer at the point of sale. Generally funded by the brand, and siting negotiated with the retailer, product displays can be in the form of single use palletised shippers constructed in card, to hard wearing multi-use displays in longer life materials such as metals, plastics or wood. Signwaves specialise in longer life displays and have a selection of generic designs for different market sectors that can be easily customised to suit individual customer requirements. FSDU’s (Floor Standing Display Units) are available in a number of standard forms and are perfect for strategic positioning and stimulating impulse sales. 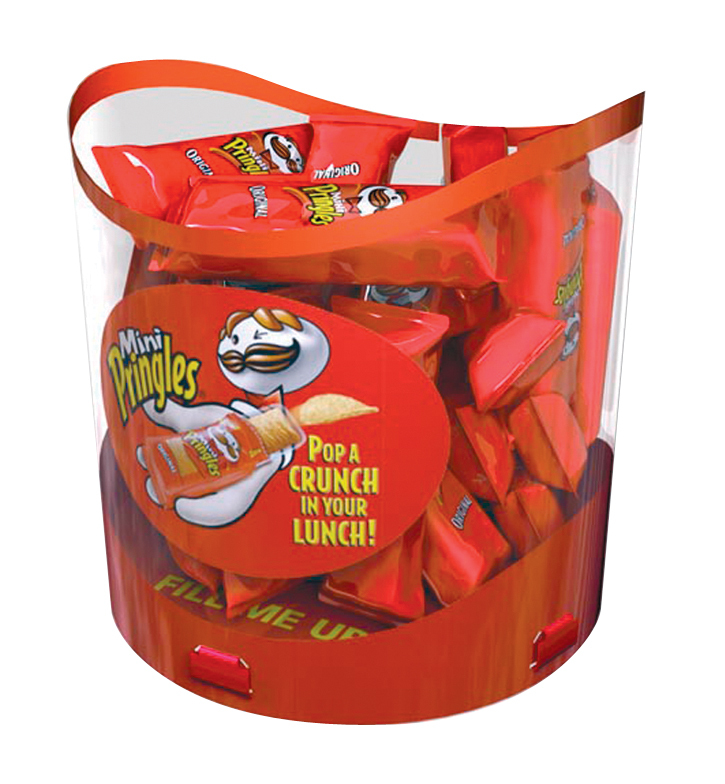 For smaller lightweight products such as confectionery, snacks and crisps, clothing and sports accessories, the Freestanding Dumpbin is ideal and very cost effective. The cylindrical, tiered, flat-pack design in crystal clear polypropylene separates and bulk merchandises different flavours or product varieties whilst providing 360 degree product visibility. Along with the complimentary single bin Counter Top variant it is perfect for positioning at the checkout or sales counter. Signwaves also offer Tiered Product Display Racks. Flat pack for efficient storage and distribution the combination of injection moulded polypropylene trays and unique push-fit tapered styrene legs results in a plastic rack system that is stronger and more rigid than similar designs as well as being fully recyclable. Hard wearing, easy to clean, updateable and fully modular, with up to five tiers possible, cost savings of over 50% have been demonstrated versus cardboard displays. Plastic racks also allow shopping from all sides if required, something that isn’t possible from a cardboard unit. With ‘eggshell’ and customised tray designs possible Tiered Product Display Racks are perfect for family size soft drinks bottles, toiletries and hair care, decorating, automotive accessories, snacks, confectionery, pet, garden and household goods. For larger products such as food and beer multi-packs, or bulk bags of compost or animal feed for example, the Case Stacker is a very effective and functional FSDU. As with the Tiered Product Display Rack it benefits from easy to update graphic panels in low cost card or plastic making the displays infinitely adaptable to suit changing offers and promotions. 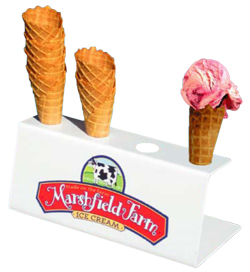 The impulse ice cream sector understands better than most the value of point of purchase (POP) signs and displays, and for those retailers offering scoop or whipped ice cream in particular, Signwaves Ice Cream Cone Holders are a must have display and dispense accessory. Available in acrylic (Perspex), powder coated aluminium and now stainless steel, these practical and highly effective counter displays provide an eye-level brand advertisement and visual sample stimulus which customers can’t help but notice. This holder design is easily adaptable to hold chip cones. For the automotive tyre industry Signwaves has developed two generic displays, the Beartrap Tyre Stand for displaying a single tyre indoors, and the Tyre Trolley for displaying multiple tyres on the forecourt. Adaptable to take a wide range of tyre sizes the Beartrap could be used on the floor but is particularly effective at shelf or counter height. It supports a tyre, with or without a wheel, so that the product and tread design take centre stage. The Tyre Trolley offers a perfect combination of effective product promotion and functional purpose, providing the tyre retailer with a secure tyre display that is easy to move whilst giving the manufacturer competitive brand presence at the point of sale. All product displays are fully customisable in terms of colour and branded print.